The Town of Mount Pleasant recently celebrated the Grand Opening of its new $29 million Town Hall on Tuesday, August, 9th, 2017. DWG is privileged to have been a part of the design team for this three-and-a-half-year project, providing mechanical, electrical, plumbing, fire protection, and communications design for the new 92,000 square foot, three-story building. The new Town Hall was designed with the Mount Pleasant community at the forefront, and public participation was vital in planning the building. Two items deemed important to residents were traditional architectural design and incorporation of the Town’s history and culture. With these criteria in mind, bricks on the structure's exterior match 19th-century bricks once manufactured in the area, and interior wood is a mixture of maple and cherry, the contrasting colors meant to resemble sweetgrass baskets. History panels and artifacts can be found throughout the facility, and the building holds the Town’s first History Room. The building was constructed to be a welcoming place for its more than 250 employees as well as the community of Mount Pleasant. Staff office areas combine private offices and open work spaces. Secondary lobbies for all Town departments can be accessed from the main public hallway. 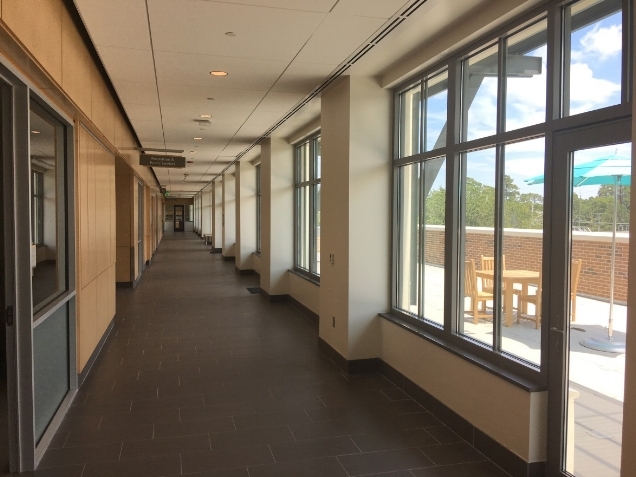 Large windows throughout the facility allow for plenty of natural light. Lounge areas offer free Wi-Fi, and abundant meeting areas are available for public use. An inviting third floor terrace provides views of the Arthur Ravenel Jr. Bridge. Employees and Mount Pleasant residents alike will enjoy an eco-friendly, energy efficient Town Hall. The state-of the-art building was designed to meet Energy Star requirements for energy efficiency. Thermally broken windows and exterior shading protect against the summer heat. 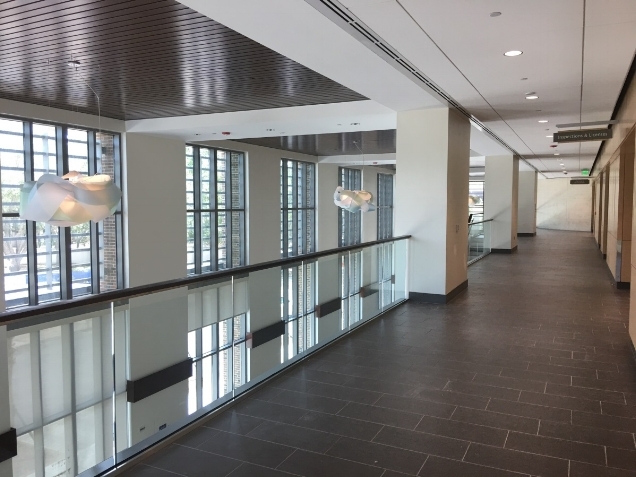 DWG utilized LED lighting throughout the facility, as well as automated heating and cooling systems and vacancy sensors that automatically turn lights off when rooms are not occupied. The building has a unique notification system that sends an email or text alert if an area of the building is not performing to standard. This allows a performance problem to be dealt with more quickly and efficiently. The facility also features CO2 sensors in high occupancy areas. Although the windows do not open, the inside air quality is constantly monitored. DWG designed the ventilation system to use whatever source takes the least amount of energy. At night, when people are not present, air circulation in certain sections of the building is reduced. During the day, the ventilation that brings in outside air is utilized. The new Town Hall was planned as a facility that will accommodate the community’s needs today, and for the next 75 years to come. For example, in addition to its more traditional functions, the building will serve as the Town of Mount Pleasant’s emergency operations center. Accordingly, the facility was constructed as a Class IV Essential Facility, meaning that it was built to withstand a major storm event. Also, in an effort to encourage a healthy lifestyle in Mount Pleasant, a new public gymnasium and a renovated outdoor track are planned for the site. Finally, the building was designed to allow for the future staffing changes, spacing needs, and technology upgrades that are the inevitable product of progress in an ever-growing, ever-changing town.